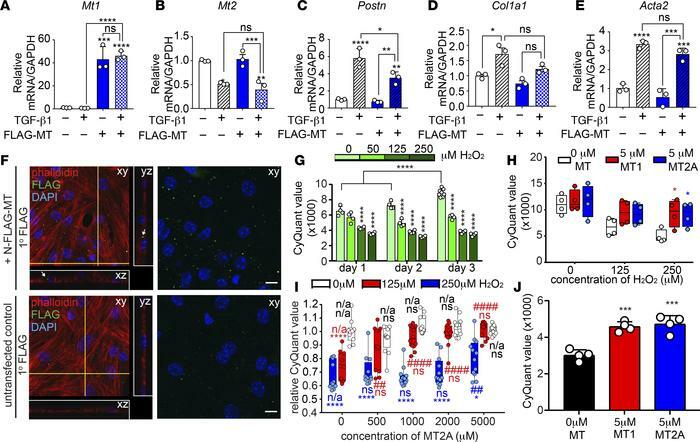 MT modestly inhibits the myofibroblast response and protects CMs from ROS-induced cell death. NIH-3T3 cells were transfected with a plasmid encoding either N-FLAG-MT1 or FLAG and treated with TGF-β1 (10 ng/ml) or vehicle. (A–E) qPCR analysis demonstrates minor but significant reduction of Postn expression in MT1-overexpressing cells but not other myofibroblast markers. Statistics were performed using 1-way ANOVA and Tukey’s post-hoc test (n = 3). *P < 0.05, **P < 0.01, ***P < 0.001, ****P < 0.0001. (F) Representative images of neonatal mouse CMs were treated with conditioned media from untransfected NIH-3T3 cells or cells expressing N-FLAG-MT1. Confocal immunofluorescent detection of FLAG localization reveals uptake of N-FLAG-MT1 by CMs (white arrows). Yellow lines on the xy plane indicate orthogonal planes outlined in white (yz and xz). Scale bars: 10 μm. Experiment was performed 4 independent times. (G) Neonatal mouse CMs were treated with indicated dose of H2O2, and cell number was assessed by CyQuant DNA-dye incorporation. H2O2 treated CM displayed reduced viability compared with untreated CMs at the indicated treatment time (n = 4 per data point). (H) Neonatal mouse CMs were treated with indicated concentration of H2O2 and recombinant MT1 or MT2A, followed by CyQuant DNA-dye incorporation to assess cell number. MT1 and MT2A were equally able to protect neonatal CMs from H2O2-induced cell death (n = 4 per data point). (I) Neonatal mouse CMs were cultured in the presence of 0, 125, or 250 μM H2O2 and 0, 500, 1000, 2000, or 5000 nM of recombinant rabbit MT2A. CyQuant DNA dye incorporation reveals a dose-dependent protection of CMs from cell death by MT2A (n = 12 per data point). (J) Treatment of adult CM with 5 μM MT1 or MT2A improved viability in vitro. Statistics in G–H were performed using 2-way ANOVA and Tukey’s post-hoc test (n = 4 per data point). *P < 0.05, ****P < 0.001, ****P < 0.0001 compared with 0 μM H2O2 within indicated MT2A treatment. ##P < 0.01, ####P < 0.0001 compared with 0 nM MT2A within indicated H2O2 treatment.